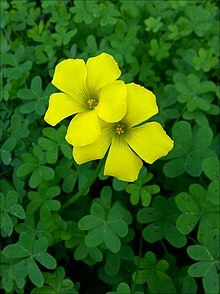 For other uses, see Oxalis (disambiguation). Oxalis /ˈɒksəlɪs/ is a large genus of flowering plants in the wood-sorrel family Oxalidaceae comprising about 570 species. The genus occurs throughout most of the world, except for the polar areas; species diversity is particularly rich in tropical Brazil, Mexico and South Africa. Many of the species are known as wood sorrels (sometimes written "woodsorrels" or "wood-sorrels") as they have an acidic taste reminiscent of the sorrel proper (Rumex acetosa), which is only distantly related. 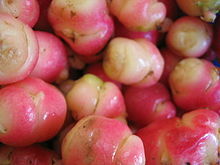 Some species are called yellow sorrels or pink sorrels after the color of their flowers instead. Other species are colloquially known as false shamrocks, and some called sourgrasses. For the genus as a whole, the term oxalises is also used. These plants are annual or perennial. The leaves are divided into three to ten or more obovate and top notched leaflets, arranged palmately with all the leaflets of roughly equal size. The majority of species have three leaflets; in these species, the leaves are superficially similar to those of some clovers. Some species exhibit rapid changes in leaf angle in response to temporarily high light intensity to decrease photoinhibition. 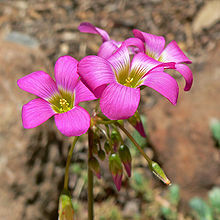 Several Oxalis species dominate the plant life in local woodland ecosystems, be it Coast Range ecoregion of the North American Pacific Northwest, or the Sydney Turpentine-Ironbark Forest in southeastern Australia where least yellow sorrel (O. exilis) is common. In the United Kingdom and neighboring Europe, common wood sorrel (O. acetosella) is the typical woodland member of this genus, forming large swaths in the typical mixed deciduous forests dominated by downy birch (Betula pubescens) and sessile oak (Quercus petraea), by sycamore maple (Acer pseudoplatanus), common bracken (Pteridium aquilinum), pedunculate oak (Q. robur) and blackberries (Rubus fruticosus agg. ), or by common ash (Fraxinus excelsior), dog's mercury (Mercurialis perennis) and European rowan (Sorbus aucuparia); it is also common in woods of common juniper (Juniperus communis ssp. communis). 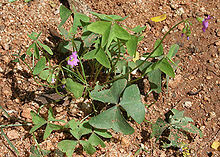 Some species – notably Bermuda-buttercup (O. pes-caprae) and creeping woodsorrel (O. corniculata) – are pernicious, invasive weeds when escaping from cultivation outside their native ranges; the ability of most wood-sorrels to store reserve energy in their tubers makes them quite resistant to most weed control techniques. Tuberous woodsorrels provide food for certain small herbivores – such as the Montezuma quail (Cyrtonyx montezumae). 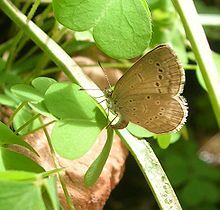 The foliage is eaten by some Lepidoptera, such as the Polyommatini pale grass blue (Pseudozizeeria maha) – which feeds on creeping wood sorrel and others – and dark grass blue (Zizeeria lysimon). Oxalis species are susceptible to rust (Puccinia oxalidis). 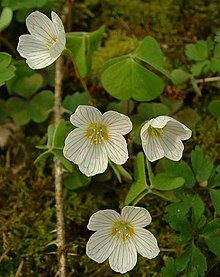 Wood sorrel (a type of oxalis) is an edible wild plant that has been consumed by humans around the world for millennia. 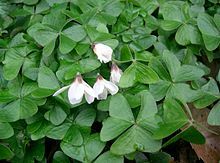 In Dr. James Duke's Handbook of Edible Weeds, he notes that the native American Kiowa people chewed wood sorrel to alleviate thirst on long trips, the Potawatomi cooked it with sugar to make a dessert, the Algonquin considered it an aphrodisiac, the Cherokee ate wood sorrel to alleviate mouth sores and a sore throat, and the Iroquois ate wood sorrel to help with cramps, fever and nausea. The fleshy, juicy edible tubers of the oca (O. tuberosa) have long been cultivated for food in Colombia and elsewhere in the northern Andes mountains of South America. It is grown and sold in New Zealand as "New Zealand yam" (although not a true yam), and varieties are now available in yellow, orange, apricot, and pink, as well as the traditional red-orange. The leaves of scurvy-grass sorrel (O. enneaphylla) were eaten by sailors travelling around Patagonia as a source of vitamin C to avoid scurvy. In India, creeping wood sorrel (O. corniculata) is eaten only seasonally, starting in December–January. The Bodos of north east India sometimes prepare a sour fish curry with its leaves. The leaves of common wood sorrel (O. acetosella) may be used to make a lemony-tasting tea when dried. A characteristic of members of this genus is that they contain oxalic acid (whose name references the genus), giving the leaves and flowers a sour taste which can make them refreshing to chew. In very large amounts, oxalic acid may be considered slightly toxic, interfering with proper digestion and kidney function. However, oxalic acid is also present in more commonly consumed foods such as spinach, broccoli, brussels sprouts, grapefruit, chives, and rhubarb, among many others. General scientific consensus seems to be that the risk of sheer toxicity, actual poisoning from oxalic acid in persons with normal kidney function is "wildly unlikely". While any oxalic acid-containing plant, such as Oxalis, is toxic to humans in some dosage, the U.S. National Institutes of Health note that oxalic acid is present in many foodstuffs found in the supermarket and its toxicity is generally of little or no consequence for people who eat a variety of foods. In the past, it was a practice to extract crystals of calcium oxalate for use in treating diseases and as a salt called sal acetosella or "sorrel salt" (also known as "salt of lemon"). Growing oca tuber root caps are covered in a fluorescent slush rich in harmaline and harmine which apparently suppresses pests. Creeping wood sorrel and perhaps other species are apparently hyperaccumulators of copper. The Ming Dynasty text Precious Secrets of the Realm of the King of Xin from 1421 describes how O. corniculata can be used to locate copper deposits as well as for geobotanical prospecting. It thus ought to have some potential for phytoremediation of contaminated soils. Several species are grown as pot plants or as ornamental plants in gardens, for example, O. versicolor. 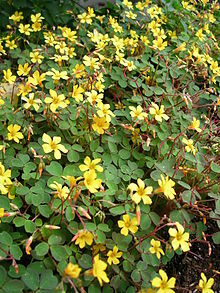 Oxalis flowers range in colour from whites to yellows, peaches, pinks, or multi-coloured flowers. Some varieties have double flowers, for example the double form of O. compressus. Some varieties are grown for their foliage, such as the dark purple-leaved O. triangularis. 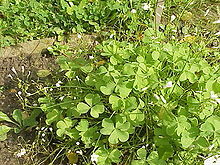 Species with four regular leaflets – in particular O. tetraphylla (four-leaved pink-sorrel) – are sometimes misleadingly sold as "four-leaf clover", taking advantage of the mystical status of four-leaf clover. Oxalis stricta [verification needed] – common yellow woodsorrel, common yellow oxalis, upright yellow-sorrel, lemon clover, "pickle plant", "sourgrass, "yellow woodsorrel"
^ "Oxalis". NC State University. ^ S. L. Nielsen, A. M. Simonsen (September 2011). "Photosynthesis and photoinhibition in two differently coloured varieties of Oxalis triangularis — the effect of anthocyanin content". Photosynthetica. 49 (3): 346–352. doi:10.1007/s11099-011-0042-y. ^ Mahr, Susan (March 2009). 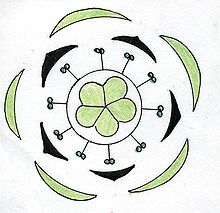 "Shamrocks, Oxalis spp". Master Gardener Program University of Wisconsin-Extension. ^ "Archived copy". Archived from the original on 2005-10-24. Retrieved 2005-10-18. CS1 maint: Archived copy as title (link) "Oxalic Acid Content of Selected Vegetables"
^ http://oxalicacidinfo.com/ "Sheer toxicity – actual poisoning – from ingested oxalic acid is wildly unlikely. The only foodstuff that contains oxalic acid at concentrations high enough to be an actual toxicity risk is the leaves – not the stalks, which is what one normally eats – of the rhubarb plant. (And you'd need to eat an estimated 11 pounds (5kg) of rhubarb leaves at one sitting for a lethal dose, though you'd be pretty sick with rather less.)" ^ http://dietary-supplements.info.nih.gov/factsheets/calcium.asp "Other components in food: phytic acid and oxalic acid, found naturally in some plants, bind to calcium and can inhibit its absorption. Foods with high levels of oxalic acid include spinach, collard greens, sweet potatoes, rhubarb, and beans. Among the foods high in phytic acid are fiber-containing whole-grain products and wheat bran, beans, seeds, nuts, and soy isolates. The extent to which these compounds affect calcium absorption varies. Research shows, for example, that eating spinach and milk at the same time reduces absorption of the calcium in milk. In contrast, wheat products (with the exception of wheat bran) do not appear to have a negative impact on calcium absorption. For people who eat a variety of foods, these interactions probably have little or no nutritional consequence and, furthermore, are accounted for in the overall calcium DRIs, which take absorption into account." 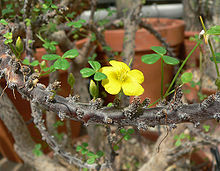 Wikimedia Commons has media related to Oxalis. This page was last edited on 29 January 2019, at 13:51 (UTC).